My April to July trip from Bangkok to London along the Silk Road this year gave me plenty of opportunity to muse about safety on the roads. There was no question that we went through some countries where the roads were horribly unsafe. There was general agreement that the driving in Iran was terrifying and the statistics backed up that feeling. 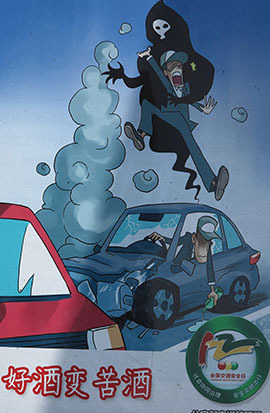 Annual road deaths per million in Iran – 321. That’s 11 times as bad as the UK which at 29 million is about as good as it gets, Sweden just beats it at 28. ◄ Don’t drink and drive, a warning in China. ▲ And don’t speed, another China warning. Countries do turn their accident statistics around. We’re all driving much safer cars these days, but just as important as the cars are the drivers and despite protests about the freedom of the road speed limits and drink driving enforcement have also played a huge part in reducing the road toll. Spain, which used to have a truly developing world accident rate is now only a smidge worse than the northern European pace setters at 37 per million. Incidentally Germany at 43 is pretty good, despite those speed-limit-free autobahns. South Korea, which was a truly scary place to drive when cars first started to flood country, is today like most other modern, affluent, industrialised nations. 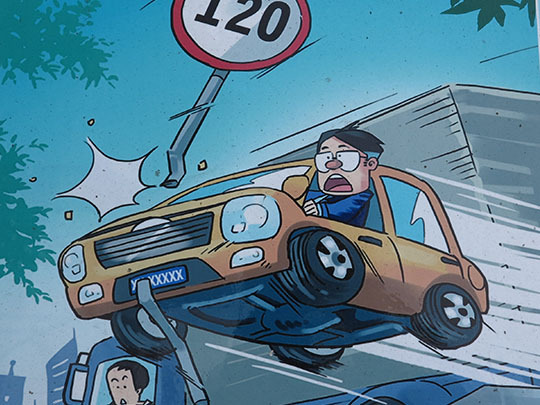 When a country has modern vehicles and still manages to have a non-modern world accident rate – like Saudi Arabia or the UAE – it’s usually down to lousy driving. 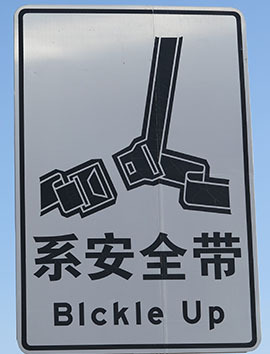 ◄ A standard Chinese freeway warning – with a standard spelling error – warning you to use your seat belts. Clearly the Chinese are intent on bringing their accident rate down to modern levels. There is, however, one modern, wealthy, industrialised nation where the accident rate is still horrifyingly high. Yep, the USA, as a recent New York Times story underlined. This is the worst place in the wealthy world for highway deaths and the reason is simple. Just as America leads the world in gun deaths – ‘guns kill people? Well who would believe that?’ – the US death rate is down to ignoring the lessons other countries have learnt. Speed cameras? That would be an infringement on American privacy. Drink driving? Isn’t it your right to drink before you hit the road? So the random breath tests which are part of life in Australia (they ramp up right about now, just before Christmas) don’t happen in the US and when limits are enforced they’re weaker than almost anywhere else. The standard US limit is 0.08 (0.08% blood alcohol level) when in most advanced countries the limit is 0.05 – if it isn’t 0.03 or even 0.00. Right now Utah (home of all those non-drinking Mormons) is trying to lead the US by cutting the limit to 0.05. And it’s facing plenty of resistance.